Many people love animals, and they know that if they ever hit an animal with their car, they would feel quite upset. Unfortunately, in addition to being upset, they could also be severely injured or even killed. Some people are not fully aware of the likelihood of serious injury or death in an accident involving a motor vehicle and an animal, especially a large or medium-sized animal like a moose, bear, or deer. About a million and a half accidents are caused by animals each year in America. Many of these accidents happen at night when animals are on the move and it is difficult for drivers to see them present in or along the side of the road. Other animals are more active at dusk and at dawn, and their activity patterns, combined with less than optimal visibility, add up to quite a few vehicle-animal collisions. The incidence of animal-related accidents also fluctuates with the changes of the seasons due to migration, hunting seasons, mating, and other factors that affect the movement of animals. Animals can be present anywhere along the road. Deer are commonly seen where there are open fields. In areas where there are trees or other tall plants along the road, animals can be hard to see until they are actually in the road. Also, some animals, like deer, are often found in groups. If you are driving and you see a deer, carefully scan the area for others that may be nearby. The weight and size of some animals, such as moose, deer, elk, and bears, can cause a very forceful impact in a collision with a vehicle. During any animal-vehicle collision, if an animal is tossed up into the air, it can crash through the front or rear windshield or even flatten the roof of the car. When this happens, serious injuries and fatalities may result. 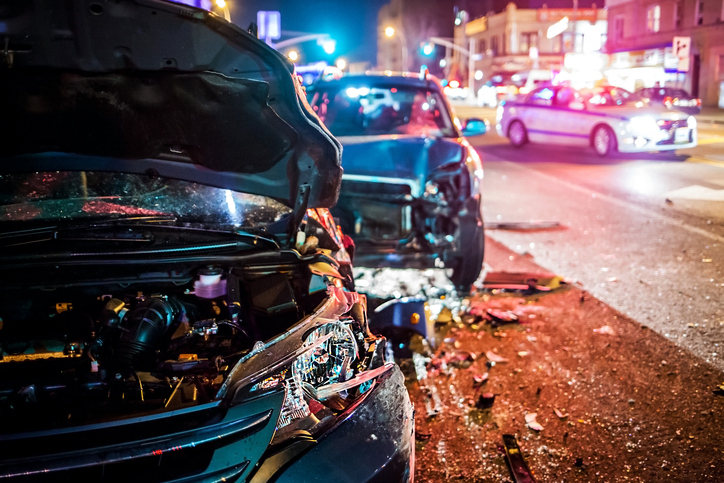 Sometimes, collisions involving animals can even cause vehicles to overturn, leave the roadway, or both, which further increases the risk that serious injuries and fatalities will occur. If you cannot avoid hitting an animal that is in the road, do your best to hit it from an angle, to increase the chance that it will be deflected away from your car instead of into the air. If you hit an animal with your car, there is likely to be extensive damage to your car. If you hit an animal with your car, it is a good idea to call the police, so that the animal can safely be removed from the roadway. Also, drivers should know that insurers sometimes try to avoid paying claims for damages in accidents that were caused by animals in cases where a police report has not been filed. If you were hurt in any type of accident, the Mississippi Car Accident Attorneys at the Giddens Law Firm, P.A. are here to help you. Please call our office today at (601) 355-2022 to learn more about your legal options. We look forward to providing you with superior legal representation.